Shadow is Evil. 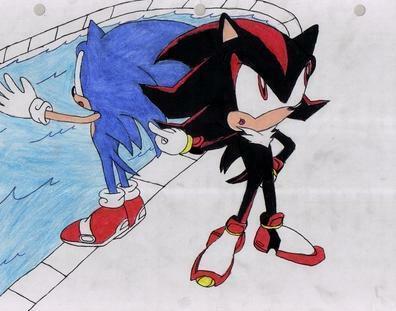 He may not look so evil, since he's only gonna push Sonic in a pool, but Remember....SONIC CAN'T SWIM!!!. Wallpaper and background images in the shadow el erizo club tagged: shadow sonic hedgehog shadow the hedgehog picture. He may not look so evil, since he's only gonna push Sonic in a pool, but Remember....SONIC CAN'T SWIM!!! PUSH HIM SHADOW DO IT! DO IT! Yes my lovely husband kill that f****** mutha f****! he's nothing but a gay chilidogs loving b*****d!!! I'm soo happy to get that out of my system. WOOOHOOOOO!DO IT SHADS!GO FOR IT!HURRY BEFORE AMY COMES! Shadow:I forgot about her!Bye Sonic! perfect way to PISS SONIC OFF!!!!!!!!! do it do it do it do it do it do it do it do it do it do it do it do it do it do it do it do it do it. Sonic: still dieing! light still fadeing! !